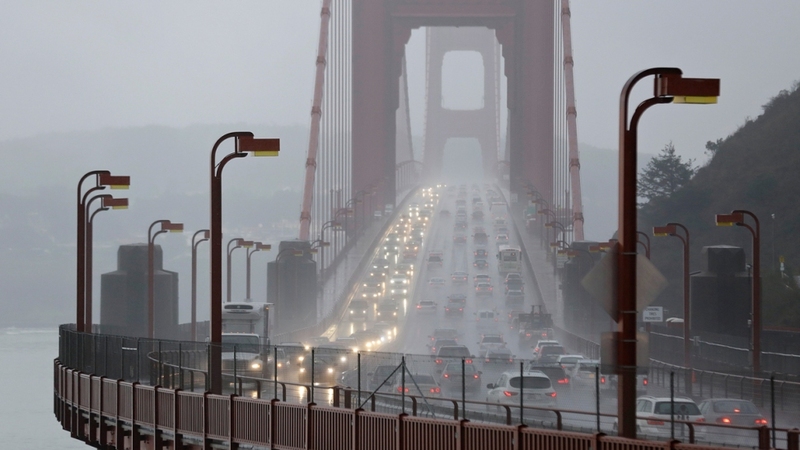 Traffic crosses the Golden Gate Bridge in the rain Tuesday, Jan. 5, 2016, in this view from Sausalito, Calif. El Nino storms lined up in the Pacific, promising to drench parts of the West for more than two weeks and increasing fears of mudslides and flash floods in regions stripped bare by wildfires. A series of El Niño-driven storms drenched California on Tuesday, the first wave of what could be two weeks of precipitation that brings the threat of major flooding and other damage and promises to soak the exceptionally parched state. Areas vulnerable to floodwaters and mudslides were on high alert amid rain that set a record in Los Angeles. Rising waters trapped cars in San Diego County, and a flash flood watch on Tuesday night covered the entire Bay Area, where the California Highway Patrol estimated at least 20 traffic accidents were caused by the storm. Roughly an inch of rain fell on most of the Bay Area Tuesday, with twice that hitting the Santa Cruz area, according to National Weather Service data. Parts of Southern California got up to 2 inches of rain, with many areas getting at least a half-inch — a significant amount for the region. The current El Niño — a natural warming of the central Pacific Ocean that interacts with the atmosphere and changes weather worldwide — has tied 1997-1998 as the strongest on record, the National Oceanic and Atmospheric Administration's Climate Prediction Center said, citing statistics that go back to 1950. El Niños usually bring heavy rains to California, although it remains to be seen whether people should expect anything like a repeat of 1997 and 1998, when storms killed 17 people, wiped out crops, washed out highways and pushed houses down hillsides. El Niño has also affected California's weather all winter. This week's weather was affected both by the phenomenon and the region's normal winter pattern, according to NBC4 Los Angeles's meteorologists. Waterlogged residents were being told not to take an end to the first round of rain Tuesday as a sign that wet weather was close to over. "A parade of strong Pacific storms characteristic of a strong El Niño event will batter the state this week and will likely bring damaging flooding by the time the second storm in the series rolls through on Wednesday," said Jeff Masters, meteorology director of the private Weather Underground. From 7 a.m. Tuesday to 7 a.m. Wednesday, the National Weather Service tracked 458 lightning strikes in Northern California, mostly over the Pacific Ocean, NBC Bay Area reported. Masters and meteorologist Ryan Maue of the private WeatherBell Analytics, however, don't believe the first storm is as powerful as some other Pacific storm systems. They caution that the storms now following it may land elsewhere. The current forecast calls for a "kind of a nice level of bombardment" over the next two weeks — probably not enough to cause the tremendous flooding of 1998, but then again, that year's floods didn't peak until February, Masters said. As much as 15 inches could fall in the next 16 days in Northern California, with about 2 feet of snow expected in the highest points of the Sierra Nevada, said Johnny Powell, a forecaster with the National Weather Service. The storm manifested itself differently along the coast. In anticipation of flooding, the Red Cross opened a shelter on Tuesday in San Diego for people who needed a place to stay for the night. That same night, a champion race-car driver fished out swamped cars and their drivers from a flooded avenue. In Southern California, between 2 and 3.5 inches of rain is predicted to fall across the coastal and valley areas, and up to 5 inches falling in the mountains. This year's El Niño phenomenon was tied for the warmest on record, The National Weather Service said Monday. Waters are 2.3 degrees Celsius above normal, joint-highest with the 1997-98 El Niño since 1950. But there were no major injury reports linked to this year's storms as of Tuesday night. But the San Diego Fire-Rescue Department responded to 75 water rescue calls between 3 and 6 p.m. Tuesday. The 1.42 inches that fell by Tuesday afternoon was more rain than any other single recorded day at Los Angeles International Airport, the NWS said. In Yosemite National Park, an LA-bound tour bus skidded off a road amid icy conditions, though only one minor injury was reported. The area saw other car crashes as well, and the nearby Bay Area was bracing for three storm systems in three days. The rain comes at a critical time for California, which is in the midst of a historic drought severe enough to prompt Gov. Jerry Brown to declare a drought state of emergency, in Jan. 2014. The rain could prove crucial in restoring the deeply depleted snowpack in the Sierra Nevada, where melting snow feeds many of the state's rivers, and the underground aquifers from which farmers in central California's agricultural breadbasket pump much of their water. But scientists caution that the rainfall shouldn't make residents complacent in their conservation efforts. In November, Californians didn't been meeting Gov. Jerry Brown's water-reduction goal of using 25 percent less water than in Nov. 2014, with water use dropping only 20 percent. California's water deficit is so deep after four years of drought that a "steady parade of storms" like these will be needed for years to come, said Mike Anderson, climatologist for the state's Department of Water Resources.